“We old-timers always went “uptown” to the Park, because most of our residential homes then were below the level of the Public Square District. Thus, it was always referred to as “Medina’s Uptown Park”. 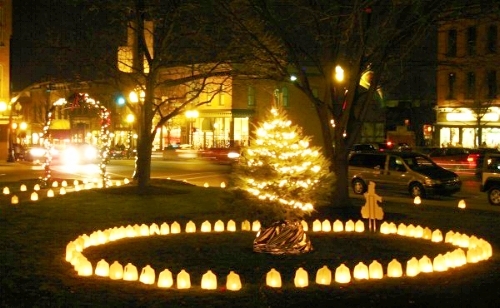 In recent years many of Medina’s newcomers and those of younger generations have refer to it as “Medina’s Public Square Park”. “Beyond the Storefronts.” will keep with the old tradition by referring to it as “The Uptown Park”. For many years, the public square has existed as the pinnacle of social life in Medina. The busy streets bustle excitedly and the Uptown Park warmly invites people from all over to take a look at the historic beauty this town has to offer. People can recognize the square's classic Victorian charm and its timeless presence which identifies the city of Medina. Weddings, community and jazz band concerts, family portraits, high school dances, picnics, and countless other activities on the square have helped define Medina as a very social and friendly town. 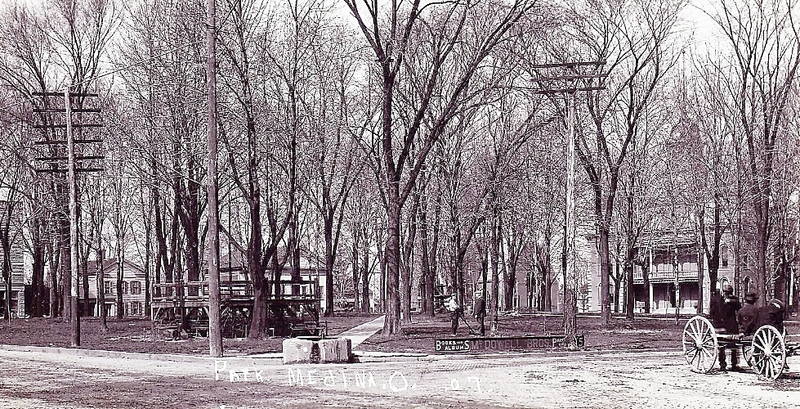 Even as several fires have destroyed the buildings surrounding the historic park grounds throughout the years, the heart of Medina, the Uptown Park, has stood the test of time and can be visited today. 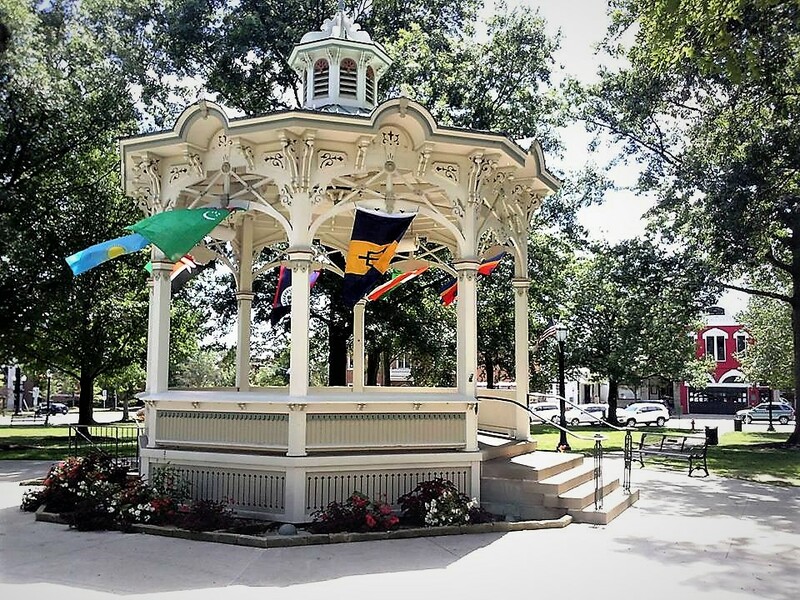 From the fountain to the gazebo, from the old wood fences to the timeless brick, the center of the town has evolved with the times but not strayed away from the beauty and old-time charm that everybody falls in love with. Many different efforts have been made to restore the public square park and maintain the fantastic Victorian style which the surrounding shops and buildings echo marvelously. 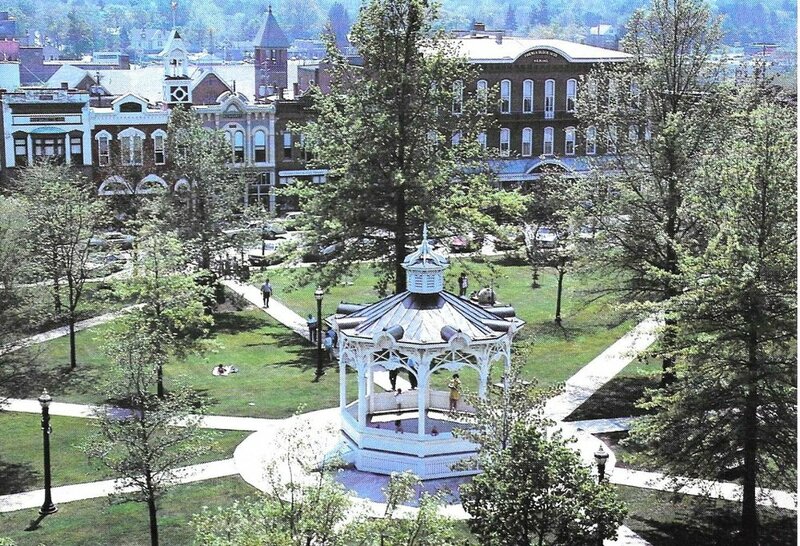 Here you can see some of the fantastic landmarks including the beautiful gazebo, the historic cannon, and countless memorial benches, not to mention the magnificent aesthetic appeal which glorifies and exemplifies the true fantastic nature of the town square and the wonderful city of Medina. Liz Rucinski, Celinna Tomlinson, “The Medina Square,” Medina Historical, accessed November 22, 2015, http://discovermedina.org/items/show/25. It had frequently been assumed that the Medina Uptown Park, which is composed of two and a fourth acres, was the property of the county seat as a corporation. From time immemorial this community has taken charge of it, improved it, protected it, and expended money upon it; but in 1950 someone with an antiquarian turn of mind investigated pioneer documents and made the discovery that the park title was vested in the people of Medina County rather than in the Village. It was so conveyed by Elijah and Anne Boardman of the Connecticut Land Company and of New Milford, Connecticut, to Lathrop Seymour, Director of County Lands and of the town of Medina, in trust for the people of Medina County, in a deed dated September 3, 1817, according to the Medina Sentinel of March 24, 1950. It’s time to give Austin Badger his due. We all enjoy Public Square during the various festivals and celebrations that take place almost continually during the year. We revel in its picturesque beauty during all four seasons and think how lucky we are to live in such a lovely, historic community. But no one ever thinks to thank Captain Austin Badger, the young pioneer who single-handedly whacked his way through three acres of primeval forest to create a village green in 1819 when the community was still in its infancy. Austin Badger was born in Green, Chenango County, New York in 1793. He volunteered for the militia when the War if 1812 began and was present when the British burned Buffalo. Six years later, he folded all his worldly possessions into a knapsack and walked from Buffalo to Cleveland, and thence to the area that would become Medina County. Rufus Ferris, land agent for Medina’s founder, Elijah Boardman, hired him as a surveyor and gave him a contract to clear the Public Square area. Badger sharpened his axe and went to work. Captain Badger was also the first resident on the Square. He built the first building — a two story log cabin on the northwest corner, presently the location of Cool Beans Coffee Shop. The ground floor served as a tavern (and his dwelling) and the second story was used as a court room. Not only did Badger clear and survey Public Square — he also assisted in naming the first streets in the village. This also happened in 1819, during the first Fourth of July celebration. The hard work did not appear to do Captain Austin Badger any harm. He lived to the venerable age of 90 and is buried in the Old Town Cemetery. So, the next time you walk across Medina’s picturesque Public Square, think of the man who wielded such a ferocious axe. And say thank you. 1. 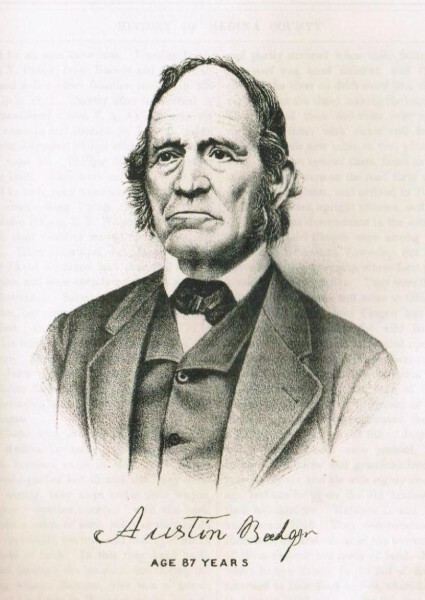 In 1819, Austin Badger laid out the Square, cleared the Square, built the first jail, and built the log house that was used as a courthouse until the first 'real' one was constructed in 1826. 2. In 1819, the streets surrounding the Uptown Park were named Liberty, Washington, Court, and Broadway by Austin Badger. 4. In 1830, a flag pole then stood on the northwest side of this public area, which at this period also served as the annual parade ground for the local militia of the county. 4a. In 1845, George W. Jordan, a powerful and fine looking man had his arm shot off while firing cannon in the park on the 4th of July. 5. In 1859, prior to a "serenade" by the Seville and Medina bands, the village of Medina joined the growing number of communities in America that supported a town band. The band, variously known as the "Medina Brass Band." 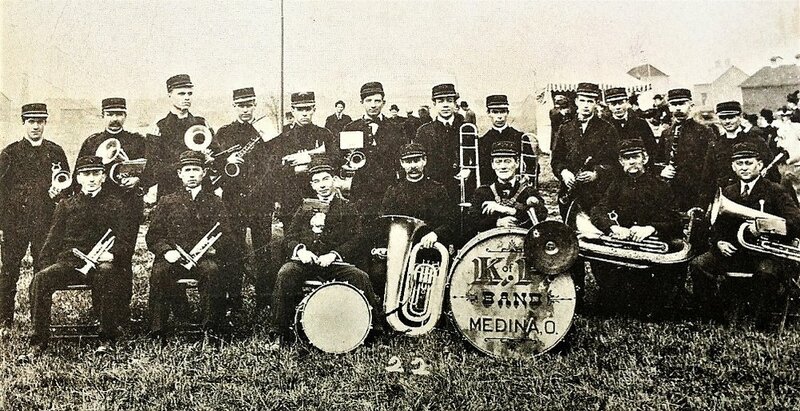 the "Medina Cornet Band," or the "Medina Cornet Brass Band," was very busy in its first year. 6. Members of the Band purchased their own instruments and hired Professor Dustin Marble of Akron as an instructor and part-time director. This band was a collection of clerks, students, bankers, painters, wagon and shoemakers and physicians and had started learning how to play their instruments and read music from scratch less than a year before. 7. In 1861, only two concerts were held. One was in Litchfield and the other in Lafayette. The Civil War probably contributed to the apparent decline in Band activities after that great start. 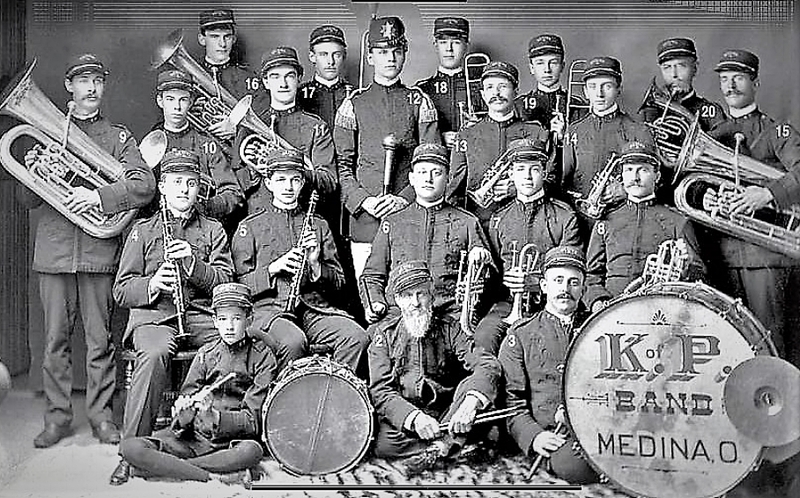 Nothing more was reported about a Medina Band for the next 27 months, since 9 of the original 13 players served at one time or another in Union forces in the War of the Rebellion. 8. In 1861, on April 23, a mass meeting of the entire county was held in the Uptown Park. Medina’s Silver Cornet Band played for hours. H. G. Blake and others gave patriotic speeches. Volunteers were called for and 200 men enlisted on the spot. 9. 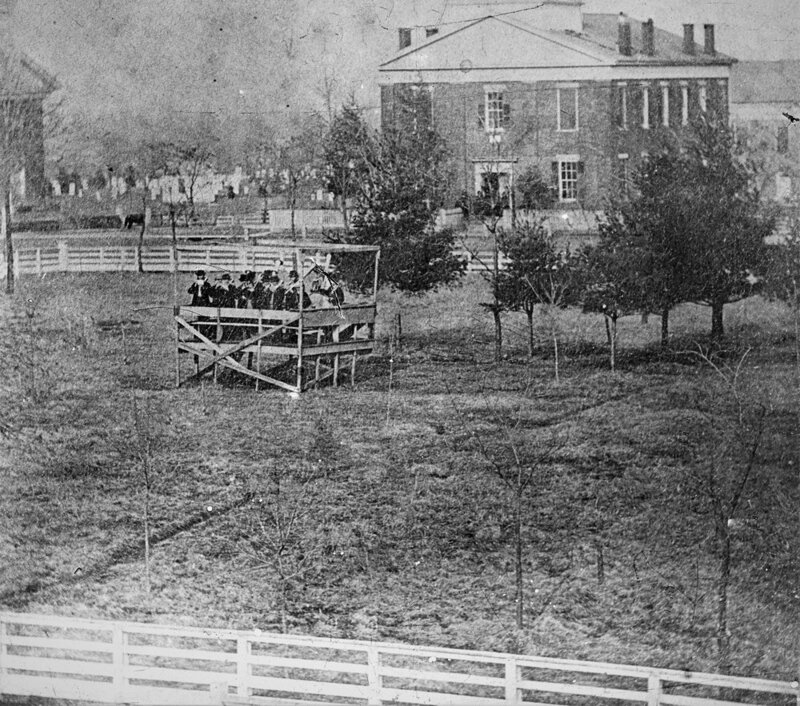 In 1862, the elm trees were planted, but the same old white fence still surrounded the park. 10. 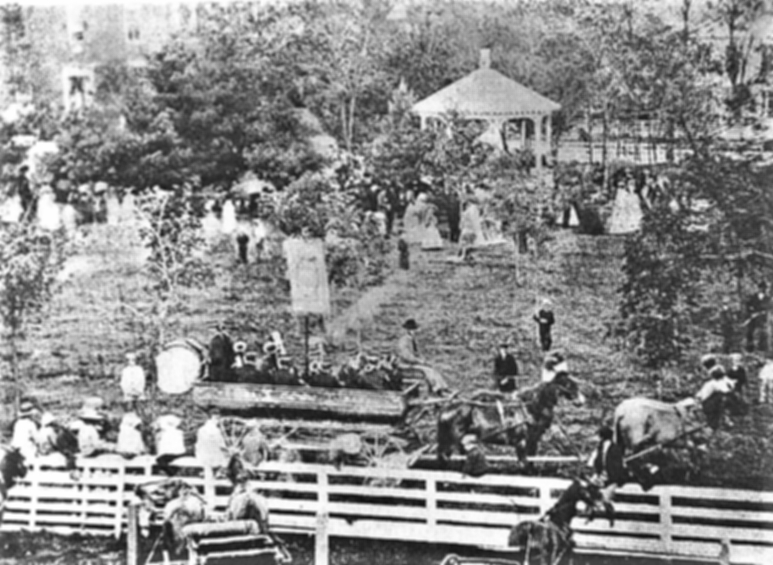 In 1862, and in years that followed, the rickety bandstand in the Uptown Park was seldom used as the Medina Cornet Band played from their bandwagon pulled by a team of horses in parades around the Uptown Park. 11. In 1861, a small bandstand was erected in the center, with many hitching posts surrounding the whole area. 13. In 1870, during the fire, the Uptown Park became a storehouse for merchants trying to save what goods they could. It was an aid station for those who were burned or exhausted from valiant efforts to stem the flames. 14. In the 1870’s, this was the park that saw the temperance rallies and yearly parades. 1. The dust rendered an out-door meeting Sunday last, anything but pleasant; yet a fair sized audience gathered in the park at the afternoon temperance meeting. The Band played several pieces admirably. 2. Miss Ella Shaw read an essay on temperance, and Rev. Homer Thrall of Litchfield delivered a sermon on ''Charity," having a direct bearing on the Murphy Temperance Movement. The sermon was listened to with the closest attention and heartily enjoyed. It was an excellent effort—one of the best addresses delivered in Medina since the Murphy campaign opened. 3. Another meeting will be held in the park next Sunday afternoon at three o'clock, to be addressed by Dr. Durstine and others. Miss Belle Wilder will also read an essay. 4. 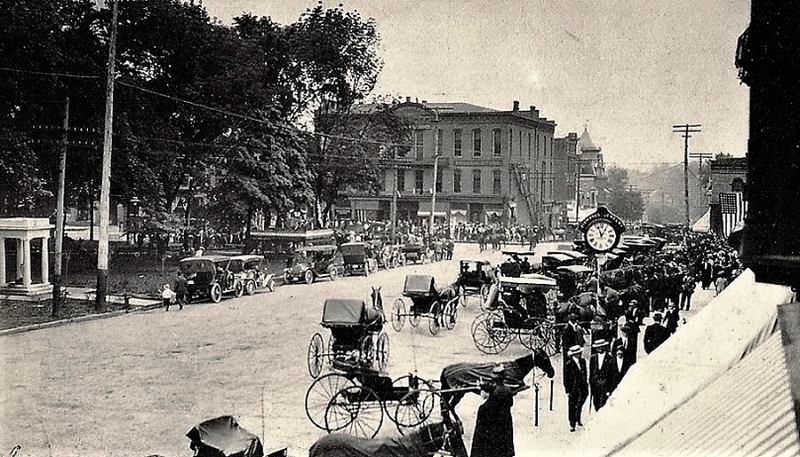 The exact date of this picture which is copied from the original by George F. High, is unknown and was taken some time in the 1860’s from a business block along the west side of the square looking east across square. 5. The occasion was a county-wide temperance rally at which many of the people present signed a “abstinence" pledge. The crowd gathered about the stand in the center of the park is listening to a speaker is undoubtedly exhorting on the evils of liquor. The scales in the left foreground were owned by the village and realized quite revenue by charging farmers 25c for weighing their wagons loaded with produce, the clerk at American House being the official weigher. 6. The white rail fence completely enclosed the square and similar fences stood before private homes to keep out the droves of cattle, sheep and hogs that were daily transported on from country to the city markets. Stock buying and driving was a regular business and Medina was on the main stock-driving roads. 7. Of great interest is the band wagon in the front foreground. The radio wasn't first to bring music to the home; in those days the village band wagon served that purpose. In the wagon, Bill Sanders, leader; Worden Babcock, Louis and Lan Smith; Will Sipher; Reuben Clark, bass drummer; Charles Manville, snare drummer and W. H. Hobart, The names of the other two men and the driver are unknown. 8. In the left background is the present court house which was remodeled and enlarged to give it its present day appearance in 1875. The old Young home which has just recently been moved from its original location can just be seen through the trees in the right background. To citizens today .the Park of this period seems strangely bare of trees. It was not until in the early 1870's that H. G. Blake, with the co-operation of Jessie Harrington and son, Henry, planted the present beautiful trees. 9. Editor's Note—this is the first of 40 old pictures which George P. High has kindly loaned lo the Gazette publication in 1937. All of the pictures were taken: by Mr. High, with the exception of three of the older ones, which were taken in 1860's, but which have been copied by him from the original. Most of the scenes were taken between 40 and 50 years ago and .should prove of Interest to the younger as well as the older generation of Medina. The second of the series will appear in next Friday's Gazette and ethers every Friday thereafter for 40 weeks in 1937..
10. In 1872, wooden sidewalks in Uptown Park are one and one half inch pine planks. 11. 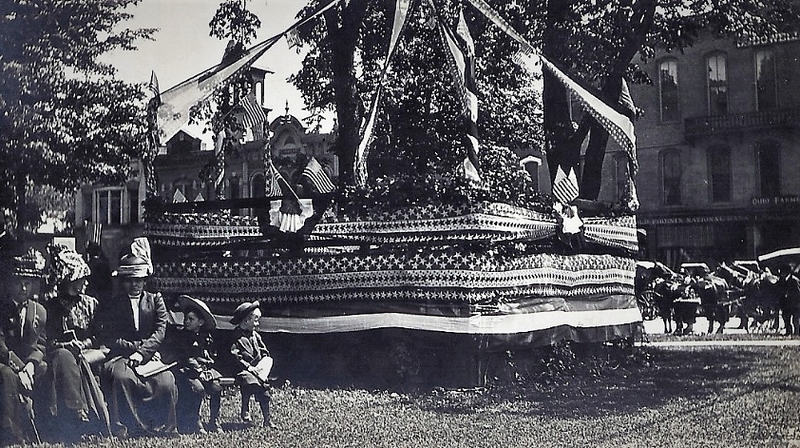 In 1876, Medina Village celebrated Independence Day prior to the centennial. The Band’s part in that celebration began at 6 a.m. after 100 cannon had been fired at 4 a.m. and understandably, “all Medina was awake.” They had a parade excursion through town, discoursing national and patriotic strains. The bandwagon was gaily decorated with flags and streamers. The regular morning exercises began at 10:00 a.m. with a parade from the Phoenix Hall led by the Medina Cornet Band. After marching around the square, the procession entered the park, and settled down for the morning’s ceremonies. The annual basket picnic for Medina and Summit Counties will be held at Averill’s grove in Bath the old ground on September 10th, 1877. The Mechanics Band of Akron and the Welch Glee Club are expected to furnish the music. Speakers from Medina, Akron and other places will address the people. The Medina County Pioneer Society, of which Hon. Hiram Bronson is President, Capt. Austin Badger vice president, and The Medina County Pioneer Society, of which Hon. Hiram Bronson is President, Capt. Austin Badger, vice president, and William P. Clark, Secretary, adjourned last year to meet again this year in the park in Medina on the first Saturday in September, which will be tomorrow. The officers have given no notice so far, of the meeting, and it is probable they are under the impression that it was fixed for a later date, but such is not the case. What will be done about it we are not prepared to say? TO BE HELD NEXT SATURDAY. Since the above was in type, we are authorized by Capt. Badger, in the absence of the president, to announce that the Pioneer meeting of Medina County will be held in the park in Medina village on Saturday, Sept. 8th, one week from tomorrow. Those interested will bear it in mind. 12. The Park-1877- The Park is the most populous part of town these summer evenings. The young people congregate there and enjoy the healthy sport of ball-playing. It is a good deal better than swarming on the sidewalks and loafing on hitching posts. 13. In Medina, the transformation of Uptown Park from a Village Green to a Victorian Park occurred after devastating fires between 1848 and 1877. These fires destroyed nearly all of the buildings on the south and west sides of the Square. As these buildings were replaced with brick buildings representative of Late Victorian Era architectural styles, the Uptown Park became more orderly and refined. 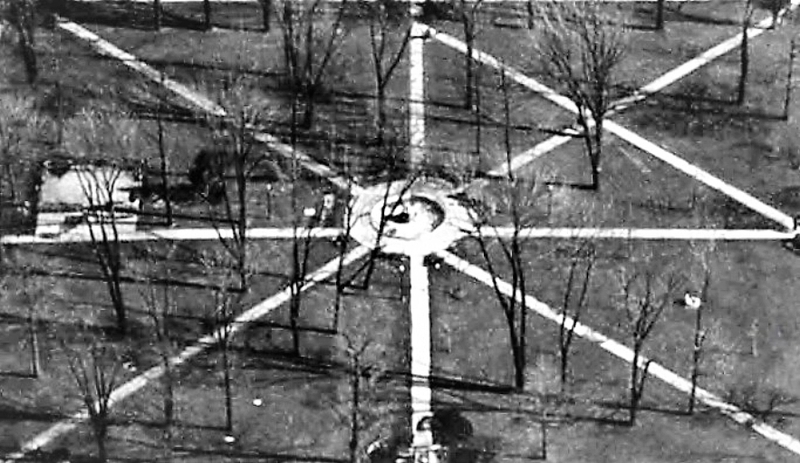 A radiating, octagonal path system with a cast iron ornamental fountain at the center of the square added elegance to the Square. The first one was that of a village green, that began in 1819 and continued through the Civil War. 14. A Village Green, a common area for community celebrations, most notably those that commemorated the birth of a new nation. It served a utilitarian purpose for farmers who had to graze or temporarily herd their animals on the Square. And it provided a place for local military regiments to train for war. All of these functions were consistent with the needs of an agriculturally based society at that time. The second life of the Square is as a Victorian Park, including the buildings and streets around it that rose from the ashes of its previous life. 15. 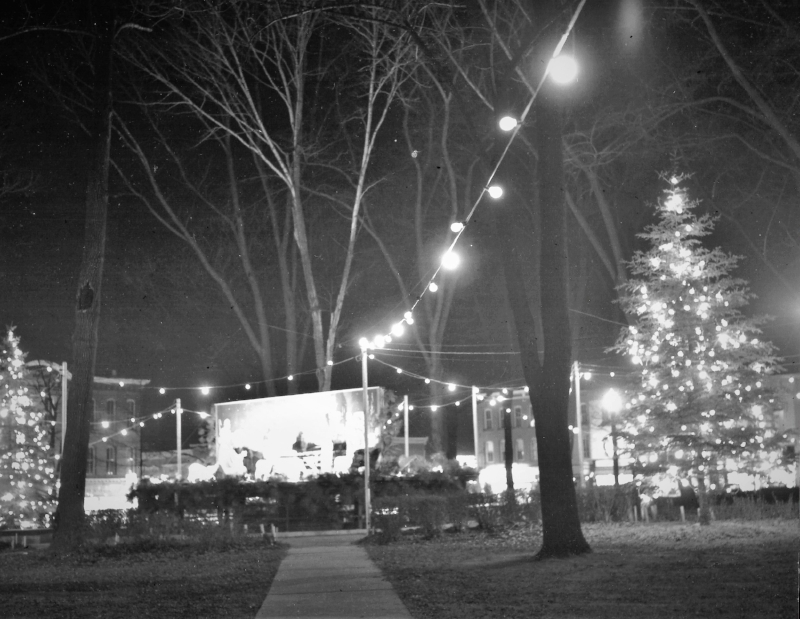 As trees were planted, fountains built, a gazebo constructed, lights installed, and stone walks laid, and the Square became an Uptown Park that was a reflection of the Victorian society and its people. They were wealthier, more educated, more sophisticated, and more diverse in interests than the pioneers. 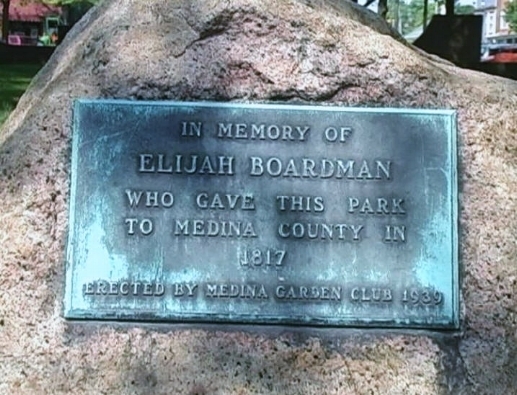 It is this image that the Medina Garden Club had of Public Square when it placed its memorial marker to Elijah Boardman in 1939. It is also this image that resulted in the Square's nomination as an historic district on the National Register in 1970. 16. The Medina Band played irregularly in the park in those days. Examples were New Year's day in 1872; Christmas day in 1874 (in uniform) and in 1875; an evening in May 1875; for the Medina County Pioneer Society basket picnic in August 1874, for which "ample seating and ice water will be provided;" and at a July, 1875 Lawn Fete by the ladies of the M.K. church. Ladies who sold food were dressed in "costumes of their grandmothers." Wonder if the grass had been mowed for these summers. 17. In 1876, a new enterprise by the Band (not new to the Village) was to give “ice cream festivals” in the park on some Saturday nights. This implies that the Medina Cornet Band played in the square on a more or less regular basis, though this supposition was not verified by newspaper accounts. 18. In 1877, the editor of the Medina Gazette repeatedly suggested to the Committee on Public Works of the village council that it would be a good idea to cut the grass therein. "One or two cuttings early in the spring, at least, will improve it for the whole summer." This would not have been much maintenance, but better than the nothing that apparently prevailed. Also suggested were that "rustic benches be placed here and there under the trees." 19. In 1877, tall trees planted along the walks offered shady spots with vistas across open lawns to the handsome buildings around the Square. Flower urns were placed as accents at strategic entry points. 20. In September, 1878, the great seven-elephant railroad circus and menagerie of Sells Brothers has come and gone. It was a bully good show. It had the seven elephants, the herd of camels, the rhinoceros, the trick mule, the trained dogs and all the other things. 21. 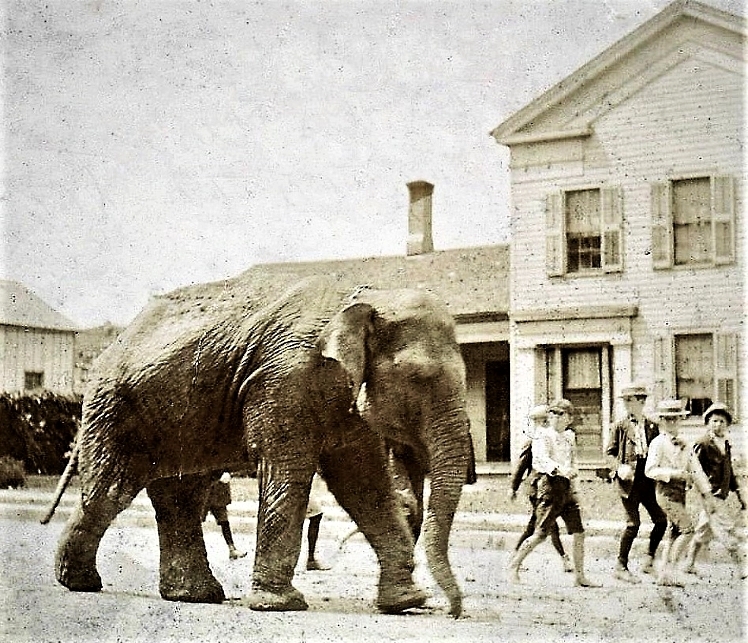 The street parade was the best that ever paraded in our streets, featuring the elephant parade from the A. I. Root Railroad station to the Public Square than return to the Medina Fairgrounds behind the A. I. Root factory. 22. The performances in the ring have been "surpassed by none and equaled by few." The crowd in town was immense and everybody seemed to get their money's worth. 23. In 1879, the old fence around the Public Square must go. The Council has ordered it to be sold. 24. The Medina G.A.R. 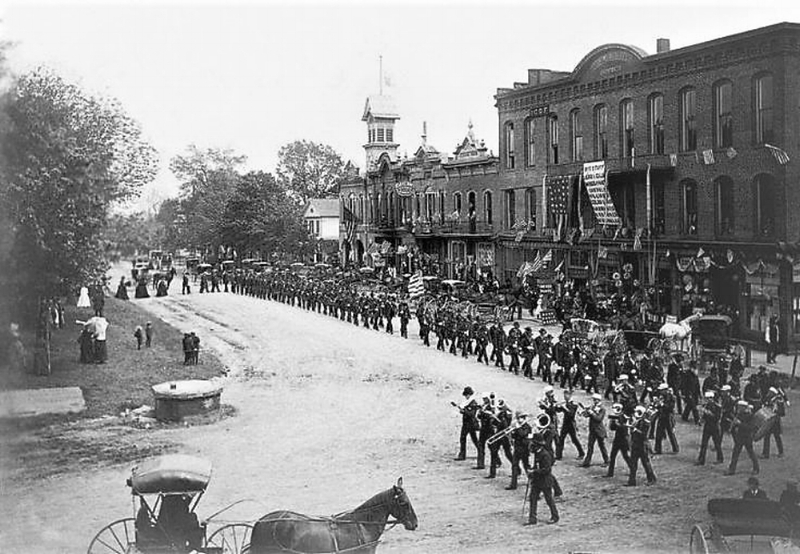 Band marching in the May 30th, 1889 Decoration Day parade. The Band has just turned the corner from Washington Street north onto Court Street. The man marching beside the band is probably Director Edward Welling. 25. 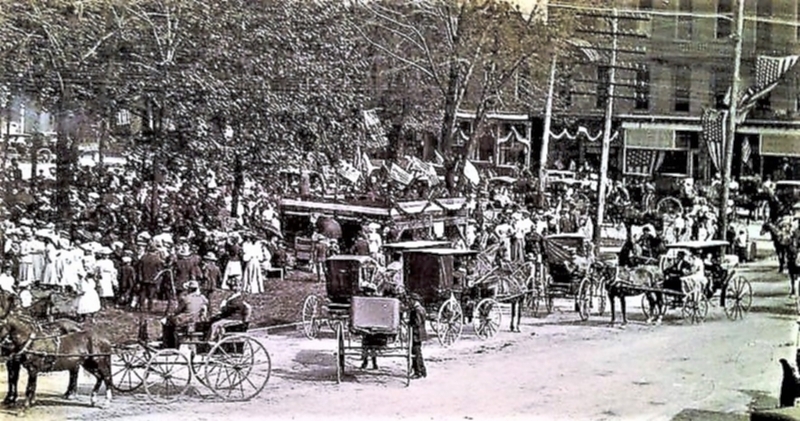 In 1890, the Band, under the name “The Citizens Band of Medina,” started a regular series of open air concerts during the summer months on the square .Unfortunately, the series was not repeated, or at least not reported, in subsequent years. However, there are hints that summer evening concerts were held on a more or less regular basis both before and after 1890. 26. West and south sides of Public Square were paved in 1894. 27. The South Court Street town hill and North Court Street paved on the east-side in 1895 by Straub and Tisher. Also paved were all of Liberty Street; South Elmwood Street from West Liberty Street to Washington Street and Washington Street from South Elmwood Street to the Public Square. 28. 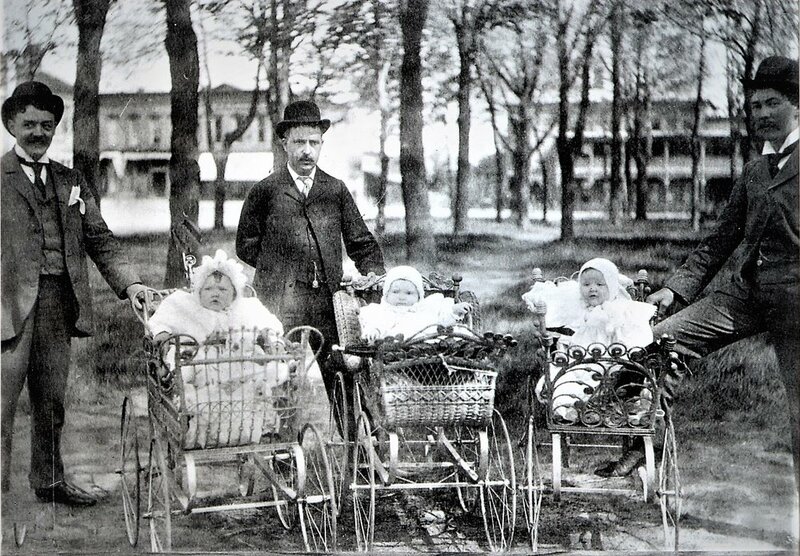 In 1898, seems that at one time in Medina’s history it was customary for proud fathers to parade their offspring’s in very classy baby buggies through the park of a bright summer day. At least Mr. High maintains that this picture was not “staged” but was taken upon the casual meeting of these three erst-while buggy-pushers on the south-side of the square. On the left is F. E. Edwards, who operates a dry goods establishment where the Medina 5 and 10 now is. The rather perturbed looking baby could not be identified but was undoubtedly one of Mr. Edward’s own. The gentleman in the center is George High, whose camera operated by a friend took this picture. The child is his daughter, Beatrice, who is now living with her parents. The dutiful husband on the right is Albert Oatman, a son of the late Simon ‘Slim” Oatman, the meat market proprietor, while the occupant of the carriage is his son, Wilber who now in 1937, lives in Cleveland. Besides the derby hats and wing tip collars adorning the gentlemen the elaborateness and the fine iron works on the buggies are products of an age hardly conscious of the stream-line age to come. An interesting feature of the Edwards carriage is the iron rod extending up from the back of the buggy to which was attached a parasol to protect the occupant from sun’s bright rays. 29. By June of 1899, Medina’s Comet Lodge No. 60 of the Knights of Pythias were talking of “organizing a band and insuring its support.” And so it came to pass that new band instruments were ordered and had arrived in early August. The new Band was out on a Saturday evening in mid-September to play “several pieces at the south-west corner of the Square.” Medina’s K of P Band, as it was now called, marched, played, and ate at one of the sponsor’s shindigs a month later. 1. In 1901, the first decade of the new century, the revitalized band was a constant fixture at all events and celebrations in the Uptown Park. The village had experienced exceptional growth since 1870 and many changes had occurred. The Uptown Park was different as well. The elm trees planted during the 1860’s were of sufficient size to offer shade and beauty. 2. In 1906-1907, the sidewalk dispute of 1897 was resolved and flagstone walks were added to the Uptown Park. 3. 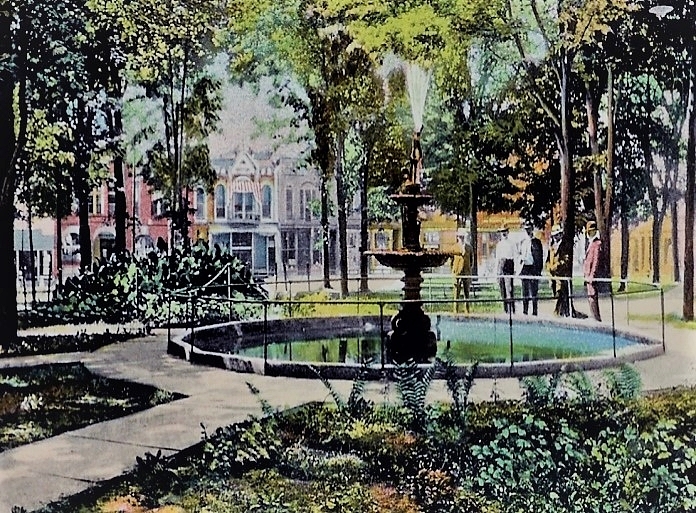 In 1906, a beautiful two tier Fountain was installed in the Uptown Park. 3a. In 1909, the Knights of Pythias Band was active in patriotic parades around the Uptown Park throughout the year, while performing at Saturday night concerts in the bandstand on the south west corner of the Uptown Park. 4. In 1911, a concrete band stand with a basement lavatories and toilet room will be built. They will try to get Mrs. Lathrop Cooley to help pay for it rather than use the $2000 left by the Reverend for public fountains. It will be a circular building 20 feet in diameter with concrete columns supporting the roof and eaves 9 feet from the floor. The basement will be ½ underground and half above ground. Seats will be arranged in a circle for the band. Idea was never accepted by Mrs. Cooley. 4a. In 1911, the Lathrop Cooley Drinking Fountain, located on the west side of the Uptown Park, was the gift of the Reverend Mr. Lathrop Cooley, who served the Medina Disciple Church as pastor from 1889 to 1892. A public spirited citizen, he also provided for the fountain's perpetual upkeep. 5. 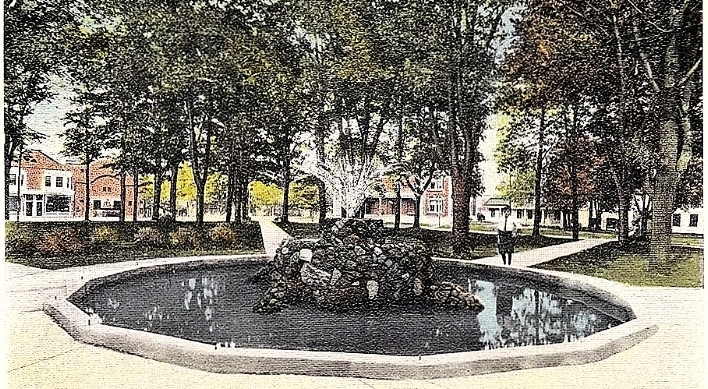 In 1914, for reasons unknown, this classic 1906 Fountain was replaced by the “Rock” Fountain. 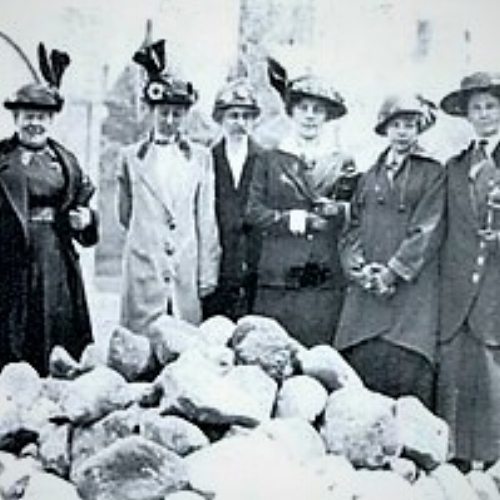 The 1914 Fountain was constructed of rocks gathered by pupils of Lincoln school from Rocky River at the request of the Medina Improvement Association. 1. In 1915 the Village Council solved a parking dispute between the new conveyance and the old horse and buggy by requiring automobiles to park only in spaces provided on the park-side around the Public Square while horses, buggies and wagons will continue to use the horse rails now existing in front of business establishments. 1. 1917-The first auto-less Sunday was observed in the county and the village about the same as in other sections of the country, that is, there were few infractions of the order of the government that no gas be used on Sundays. 6. In 1917, War once again affected the lives of Medina’s citizens, this time war on a global scale. As World War I dragged on, local enlistees in the Ohio National Guard set up their tents in the Park as they drilled in preparation for service. 6a. The end of WWI was celebrated twice in Medina, as it undoubtedly was all over the country* A premature report of an armistice on November 7, 1918 resulted "in a monster crowd ... and there was a big parade around the square and the Medina band gave a patriotic concert." When the real thing came along four days later, the celebration was even bigger, noisier, and longer-lasting than before. 7. In 1918, on November 11, at 5:15 in the morning, the fire bell awakened the community. People flocked to the Uptown Park to hear the welcome news that peace had come at last. From all over the county 10,000 people jammed the Uptown Park. The Medina Board of Trade Band led the celebration which lasted long into the night. 8. In 1920, Hitching posts removed from businesses and added around park and autos to park at businesses now. 9. 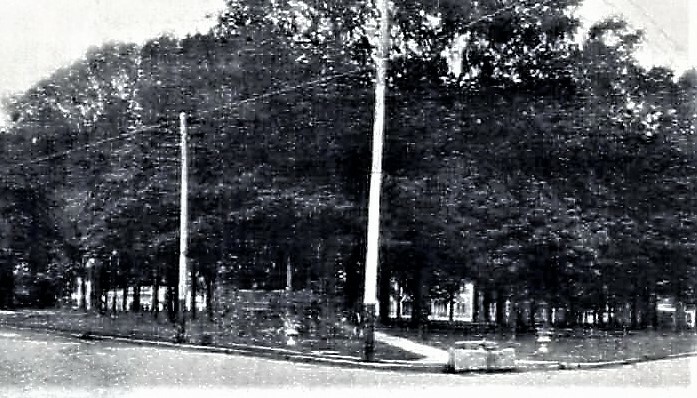 In 1920, No parking signs in front of the fire plugs installed around the park and on the corner of West Liberty and North Court Streets. 9a. June 2 1921- War trophies (cannons for public squares, are hard to come by). On a list of those available, the government will give to states based upon ratio of men sent to World War I. 9b. Medina got a 230mm Minenwerfer (literally a mine thrower) captured from the Germans in WW1, and it was placed on the north-west corner of the square. 10. In 1921, new electric guideposts installed at the NW and SW corners of the square. Wiring is ready, waiting for arrival of the glassware. 10a. In 1922, Painted lines installed at the corner of Liberty Street and Court Street and Washington Street and Court Street to prevent “jay walking”, “catter-cornering” crossing. It is suggested that large signs be erected telling people how to cross the street. 10b. In 1923, George Redway remembered the old cannon in the square 84 years ago in 1839. It was much louder than he remembered the Civil War cannons to be. 10c. The Band was part of a July fiasco in 1924 (July 1) sort of like the one of July 4, 1879. 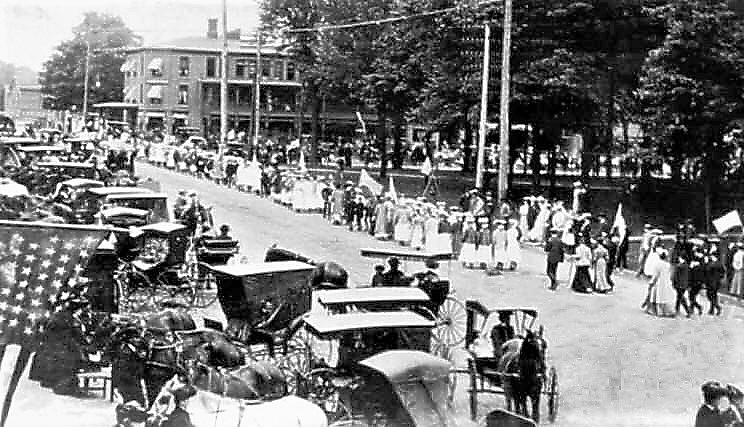 A much-heralded "Ford day parade," postponed from a month earlier, was to take place around the square. The Band fulfilled its obligation. "It marched over to the corner of North Broadway and Liberty Streets, but there was no parade there. It marched around the other half of the square and did its part by going up onto the platform (bandstand) and playing a few pieces. 10d. After a while a half dozen Fords gathered together and 'paraded1 around the square." All this prompted the Gazette to write, “‘The King of France with 40,000 men, marched up the hill, and then marched down again/ The Medina Band, with no Fords behind, marched around the square, but could not the parade find." The merchants did, however, report it to have been a good trading day. 11. In 1924, to give the citizenry some idea of what concerts from the center of the square might be like, the Band played a Saturday evening concert from a temporary bandstand erected over the fountain. 12. After two years of committee meetings and other expenditures of hot air, the Gazette held a straw vote among Medina Village citizens of all ages between leaving the fountain in the Park center or replacing it with a bandstand. The fountain won 1,447 to 49. 12a. In 1925, the Medina Kiwanis Club sponsored a “Birdhouse Sale” in the Uptown Park for birdhouses made by students of Medina High School Industrial Arts Department. 13. 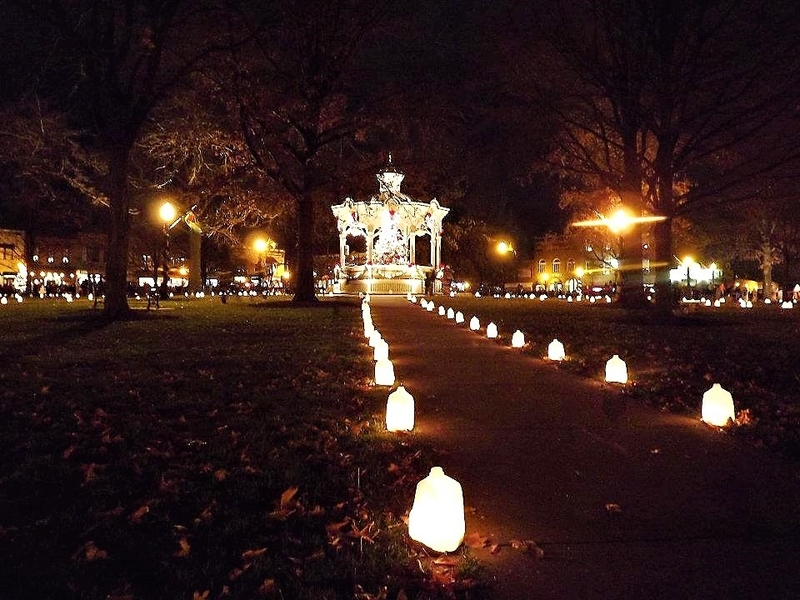 In 1926, Medina Public Square to have 100 candle power street lights, called White Way. 13a. There was a WWI Minenwerfer cannon in the park which blacksmith E. C. Miner repaired in 1928. 13b. In 1935, the German Minenwerfer WWI cannon was painted by the American Legion Post 202 who asked for a donation of a V2 gallon olive drab pain and a quart of cement paint. 14. In 1937, Medina Gazette Editorial says “Uptown Park a disgrace, the CCC workers that took care of it are now gone, who will keep it up now? 16. In 1939, it is interesting that the Garden Club considered Public Square to be a "Park" instead of a "Village Green", a "Commons", or even a "Courthouse Square". 17. In 1940, the Village began to take care of the park, a service for which it is paid one dollar a year. 17a. In 1942, when the United States entered WWII, there was a scrap drive to turn in all types of metal for the war effort. The cannon was turned in by the village council. The old plaque for the German gun wasn't turned in and remains today. 18. 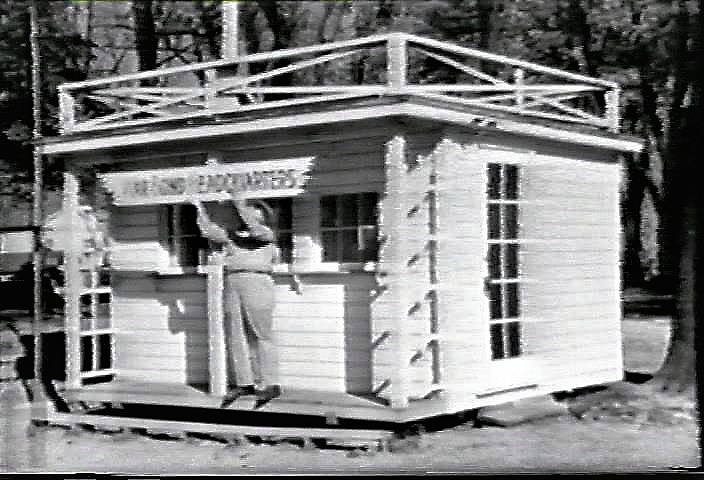 In 1942, volunteers built a small building on the west-side of the Uptown Part to house the War Bonds Headquarters of Medina County. Later that year actors and comedians Abbott and Costello came to Medina to sell war bonds from this building and Medina led the state in the purchase of war bonds. 18a. This is a picture of Elmer Zarney right after the war bond building was finished and his design on the sign was placed on the building. Zarney also influenced the Victorian design of the buildings on the town square. Zarney actually fought for the American air force during World War 2 and flew over 88 missions. 18b. This is the famous building that at one point raised over 3 million dollars towards the war effort. This building was also part of the reason why the government decided to film "Hometown U. S. A.” in Medina. As a very influential part in history, the war bond headquarters is definitely a sight to see. 19. In 1942, visible from the Uptown Park was a large billboard on the west wall of the Phoenix Block that held the names of all who were serving in WWII. Gold stars marked the names of the fallen comrades. 20. In 1943, after some lean years, the modern Community Band was created. Sponsored first by the War Bonds Committee and then the Chamber of Commerce, the new band led the celebrations as the war ended in Europe and then the Pacific. 21. In 1944, the frame bandstand was replaced by a new concrete one which was donated by Fred Snyder. 22. The Community Band performance night has changed over the years, in most cases at the urging of the business community. Season concerts have been given on Sunday, Monday, Tuesday, Thursday, Friday, and Saturday evenings. In the late 1940’s, Friday evenings became the day of choice for Uptown Park concerts. 24. In July, 1945, John Pierce, utility man at Gibbs Motor tidied up the shrubbery plots donated three years ago by various Medina merchants. 26. In 1947, the Courtney Lawrence Post 202 of the American Legion obtained new cannon from Camp Perry for the square to be placed on pedestal where the WWI gun was before it was taken for scrap metal during World War II and two 105mm howitzers for their own post and the VFW post on Pearl Road. 26a.. The one on the square is a 57 mm anti-tank gun, based on the British 6 pounder AT gun, and is still property of the U.S. Army and Post 202 is responsible for it. Several years ago, Post 202 had a proper plaque made. 27. In July, 1951 also donated to the city by Mr. and Mrs. Fred Snyder, were a fish pool and a new center fountain. This is an electrically operated fountain equipped with colored lights to vary the color of the water. It replaced one which the Snyder’s gave the town a year previously, but which did not prove to be satisfactory. 27a. During the Christmas season the fountain area was covered with planking and a Nativity Scene was displayed. 28. At one time the city expressed a desire to turn a portion of the park into a parking lot, but the idea was abandoned upon the protest of the Medina County Historical Society. 29. In 1957, the 100th anniversary celebration of the Old Phoenix National Bank filled the Park with food and merriment. 30. On April 8, 1963, a Park Commission was set up to look after the park area. 31. In 1966, the problem of lighting plagues the park, for there has been some debate over whether to replace the old atmospheric lights with new modern ones. As of 2017, however, this change has not been made. 32. In April, 1966, the most recent development affecting the Uptown Park was the establishment of a $70,000 National Park Trust for the "beautifying and perpetually maintaining" of this historic area. This trust fund will make available approximately $2,000 annually for these purposes. This Park Trust Fund is the gift of Mrs. Letha E. House of Lafayette Township, a long time Medina County resident and friend of the park. 33. In 1967, the Uptown Park began changing dramatically as the Dutch elm disease began to kill the magnificent elm trees planted 100 years before. Amid talk of paving some of the land for a parking lot, an Uptown Park Commission and later the Uptown Park Advisory Committee were established to protect and beautify the historic village green. 34. In 1967, urban renewal also threatened the historic buildings around the park and the Community Design Committee was formed to promote preservation and restoration. 35. In 1968, the Community Band filled the Public Square Park with music as Medina celebrated its 150th birthday in a city-wide party filled with civic pride. 36. In 1968 it was decided to replace the fountain with a gazebo. 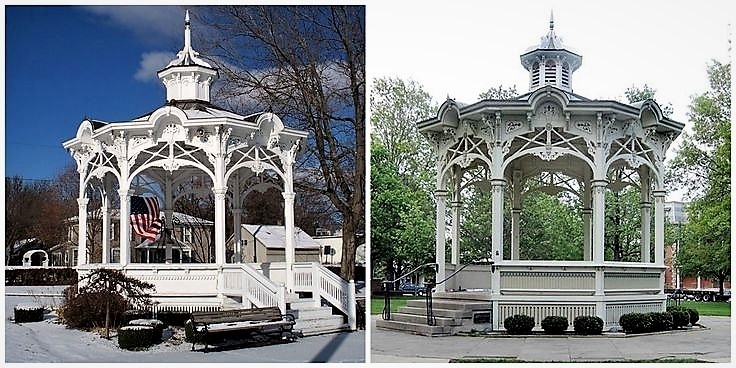 In keeping with the Victorian architecture around the Uptown Park the gazebo built in Bellville, Ohio in 1879 was reproduced on the Square in 1975. 37.. Trustees of the National Park Trust are: Mrs. Letha House; Paul M. Jones, board chairman of the Old Phoenix Bank; Ross M. Trump and Attorney Charles Clark Griesinger. 38. A newly named Medina Parks Advisory Committee is composed of: O. C. Duke, chairman; Mrs. W. W. McClelland, James Baldwin, Mrs. Elmer Nichols, and Glen Gensemer. This group will be concerned with architectural planning, beautification projects, and other matters relating to the park's use and appearance. 40. The Fine Art Show and Sale features more than 130 of the finest artists and craftsmen from across the United States. This distinctive show typically brings over 15,000 people to the Medina Uptown Park. It is a free event, open to the public. Stroll around Uptown Park while sampling art, food and live music right here in Medina, every year on the third Sunday in July, and let your senses be dazzled. 41. In 1975, cooperation with the City and using funds donated by the Letha E. House Foundation, the 1950’s fountain and goldfish pond were removed and the CDC constructed an exact replica of an 1879 gazebo for the $96,000. 42. By 1975, most of the buildings surrounding the park had been restored to the beautiful structures we know so well today. That year the Community Design Committee successfully led the fight to keep the historic lamp posts in the Uptown area. 43. 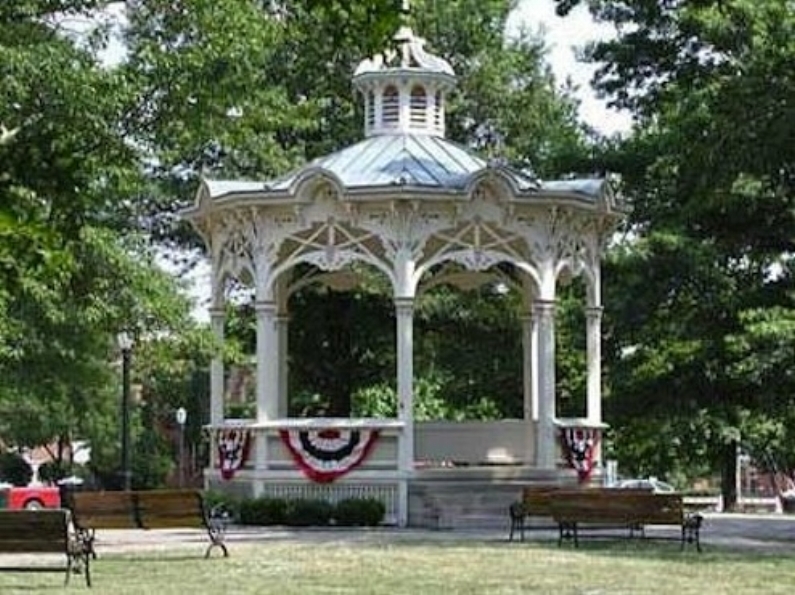 In 1975, the Medina’s Gazebo was dedicated and has become a symbol of the city and the permanent summer home of the Community Band. 44. In the 1980’s, the bandstand followed. Recent improvements have included the addition of Milestone pavement around the gazebo, electrical upgrades, site furnishings, and landscape improvements. With the recent improvements, the Square has become a major, community focal point. 45a. 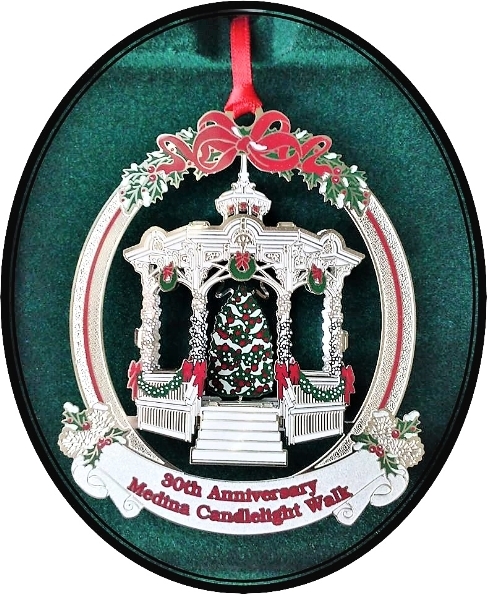 In 1994, the Uptown Park was home to the first “Medina Ice Festival”. 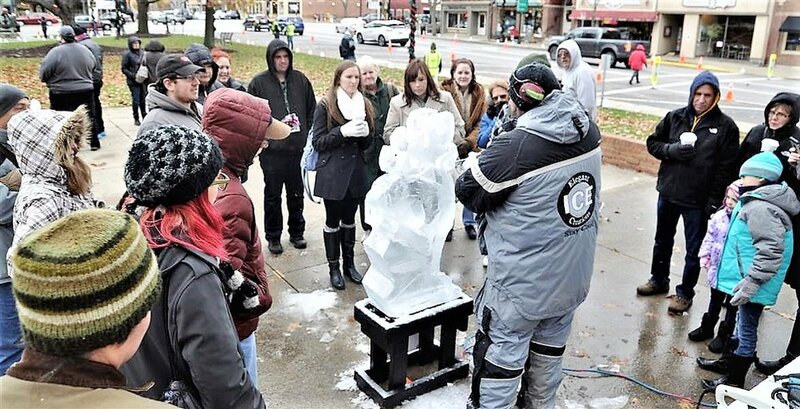 The four day ice event will showcase over 75 ice sculptures sponsored by local businesses; a speed carving competition on Friday; a team carving competition on Saturday, and an individual carving competition on Sunday. All works of ice art will be on display as they are created, and may be viewed throughout the weekend, day and night. 46. 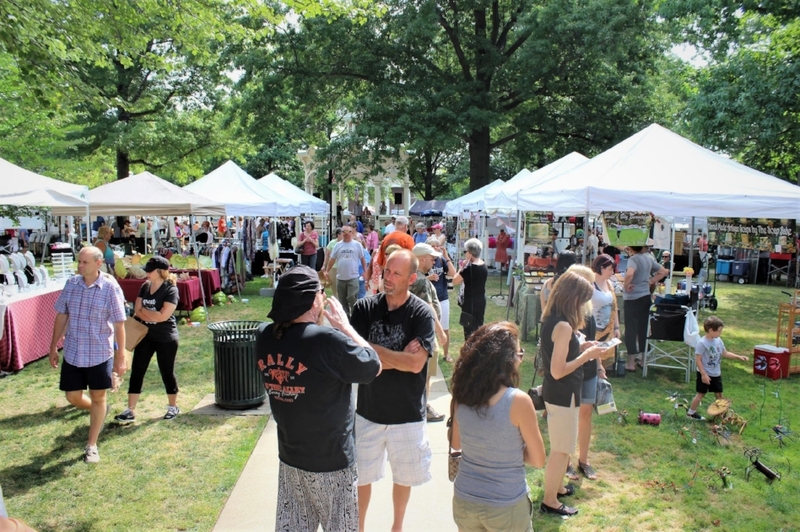 In 1994, the beautifully historic Uptown Park makes the perfect setting for almost 150 vendors to display their work at the first “Affair on the Square Craft Festival” featuring handmade crafts from around Ohio. People from miles around gathered on the square to shop for those unique items and to enjoy the blues and jazz music billowing from the Gazebo. 47. 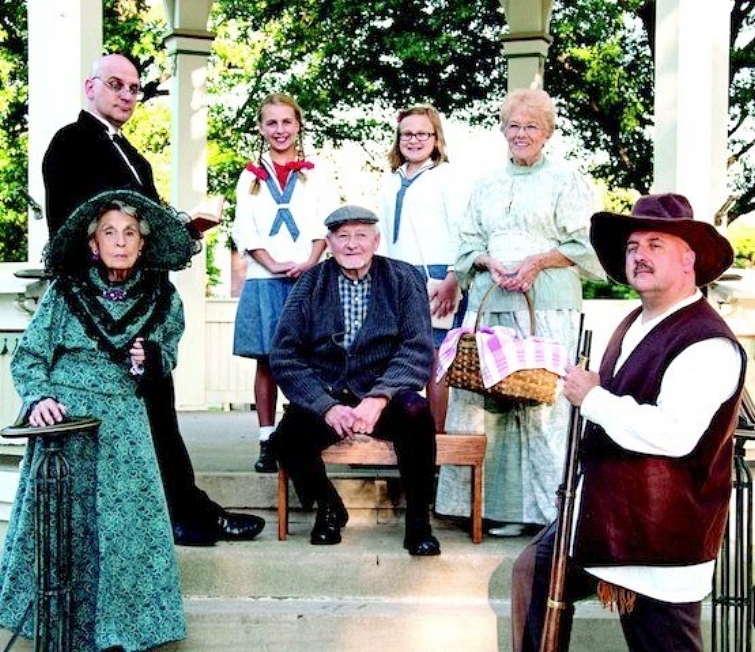 In 1995, the first “Spirit Walk” presented entertaining dramatic performances about historic events and pioneers of the Medina area, presented by The Medina County Show Biz Company, The Medina County Historical Society, and The Medina County Arts Council. About every ten minutes guides lead groups around the Medina Square area and Uptown Park to see six different performances. 48. 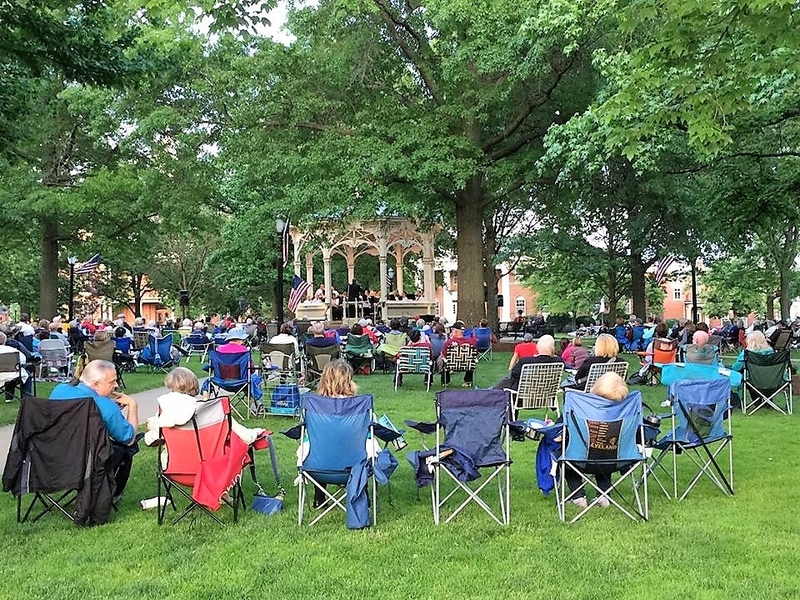 1995-The Friday Night Band Concert — Medina’s most charming and most enduring tradition — played to a large crowd gathered on lawn chairs and blankets around the Victorian confection of a gazebo in the center of the Uptown Park..
49. In 1995, another part of the Friday Night Band Concert tradition includes an ice cream social. In the northeast corner of the Square (on a concrete slab where the band concerts were held before the gazebo was erected in 1975), the Seville Presbyterian Church offers ice cream and freshly baked pies. 50. So, if you’re searching for a vanishing America — that ephemeral place of small towns, cozy communities, Victorian buildings, American flags and church socials– just stop by on any Friday night. It’s still here and it’s the real thing. 2. In December, 2000 the Uptown Park Advisory Committee was re-established by Mayor Jim Roberts. The committee at that time was made up of six community members, the City Forester and Parks and Recreation Director. 3. In early 2001, it was decided by the committee that a Master Plan should be made of the Uptown Park to ensure the preservation, beautification, maintenance, protection and enhancement of this very unique and valuable asset for the present as well as the future. 4. Behnke Associates of Cleveland, Ohio - a landscape architectural firm - was employed by the City of Medina to draw up the Master Plan. 5. Many months of planning, correspondence and meetings went into the building of this Plan by the Uptown Park Advisory Committee, City administration, Community Design Committee, members of the Medina Park Trust and Letha E. House Foundation, and members of the community. 8. 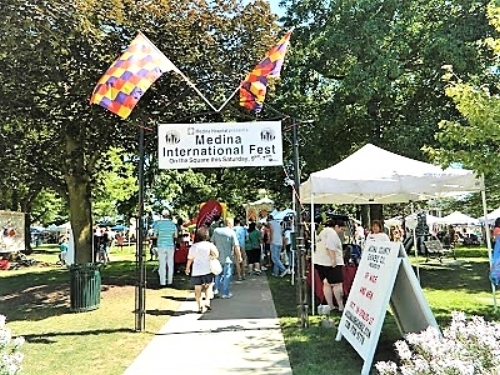 In 2008, the first “Medina International Fest” a Celebration of Community and Culture was held in the Medina Uptown Park and in nine years has grown into one of the largest single-day events in Medina County! Delivering over 15,000 attendees, the festival features 9 hours of continuous entertainment, ethnic foods, hundreds of vendors in the International Bazaar, kid’s area and so much more! 9. It’s a sure-fire sign that summer is here: White tents bloom on the green lawns of Uptown Park and the vendors arrive from all over the county to sell their wares. 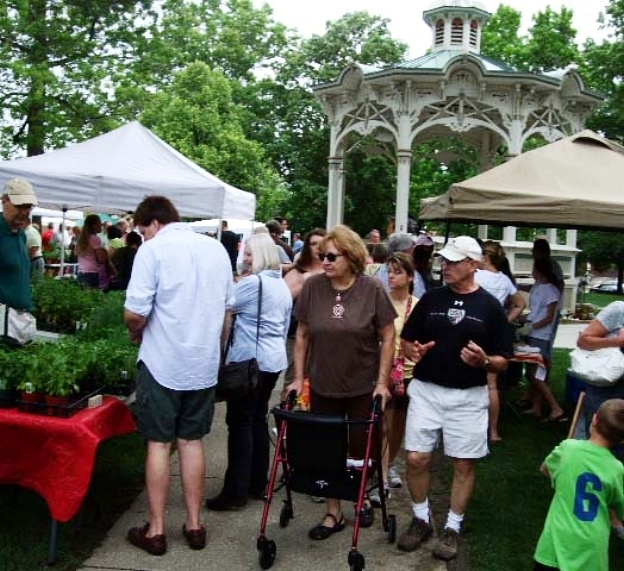 It’s “Farmers’ Market” season in Medina and it will continue every Saturday morning from June 5 to October 9, 9:00 A.M. to 1:00 P.M.
10. 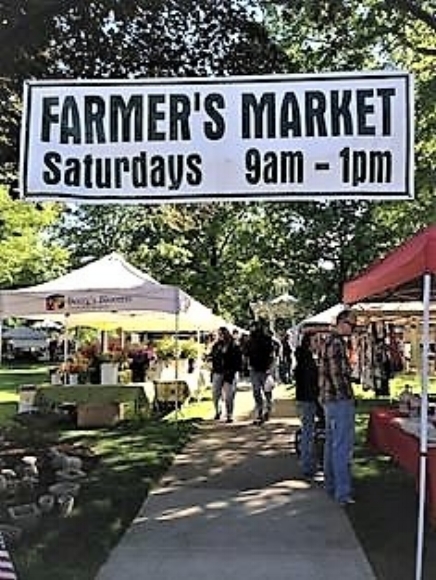 The Medina Farmers’ Market began a few years ago with just a few tents huddled in the southwest corner of the square and offered a very limited selection – tomatoes and perhaps some home-made baked goods — one Saturday a month. Today, the first days of the season, all the paths crisscrossing the park are lined with tents and the crowds are out in force. 11. The Medina Community Band’s name evolved over the years as the Medina Silver Cornet Band, Medina Band, Citizen Band, and Grand Army of the Republic Band, Knights of Pythias Band, and now the Medina Community Band. During the 158-years that the band has been in existence there have been 20 directors. 12. Over the past years, the City of Medina, the Letha E. House Foundation, the Uptown Park Advisory Committee, the Medina Park Trust and the Community Design Committee have all joined cooperatively to refurbish and beautify our beloved park. 13. In 2017, The Uptown Park Advisory Committee with Chairman, Dave McCarthy, Members: Melanie Kasten-Krause, Mike Laribee, Robert Molnar, Roger Smalley, Jansen Wehrley and Non-Voting Secretary, Sherry Crow continue to meet once a month to make recommendations for the maintenance and improvement to the Uptown Park. Uptown Park Band Concerts, 1859 158 yrs. Art in the Park, 1973 44 yrs. Candlelight Walk, 1983 34 yrs. Ice Festival 1994 23 yrs. Affair on the Square, 1994 23 yrs. Spirit Walk 1995 22 yrs. Saturday Farmers Market 2006 11 yrs. 15. 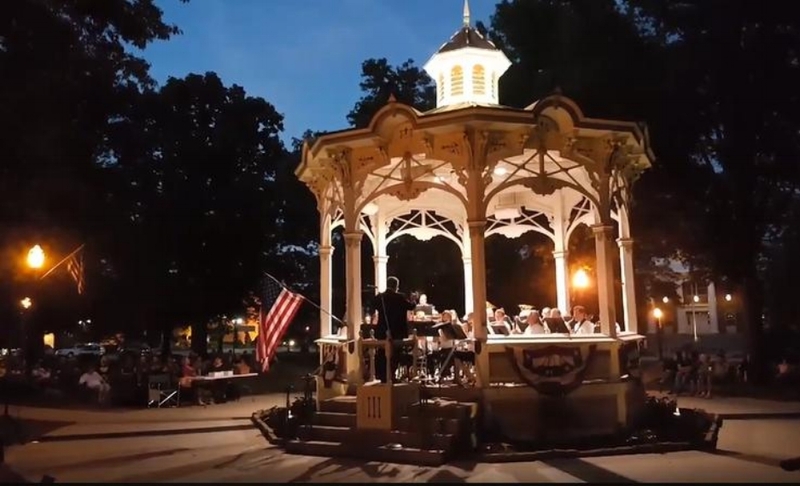 Medina Community Band will present the sixth summer concert of the 2017 summer season, a celebration of 158 years (since 1859) of presenting community concerts in Medina, on Tuesday, July 4th, 2017, at 8:30p, in Medina’s Uptown Park Gazebo. 16. Special conductors for the evening will be Ron Foster and Medina Community Band Associate Conductor David Roth. Special welcome comments will be presented by State Representative Steven Hambley; and, John Coyne, president of Medina City Council..
17. The Kiwanis Club of Medina will present the weekly ice cream social. To this day, Uptown Park has remained a green oasis for the enjoyment of all. The fact that it has changed little in the past 100 years is a testament to the success of its Victorian design. The park has become the focal point of the community, enhancing the buildings and businesses around it. Maintaining Uptown Park, into the foreseeable future, as a Victorian Park with lawns, trees, and open vistas is necessary to maintain the essential character of the City of Medina. The Uptown Park remains the heart of the city and has a special place in the hearts of Medina people.